Ian Benjamin has resigned as manager of Stewarts & Lloyds. It has been another torrid season so far for the Foundryymen in the ChromaSport United Counties League Division One. Last weekend’s 5-0 loss at Blackstones was their 21st defeat from as many league matches while they have scored just 13 goals and conceded 87. Benjamin stepped down on Tuesday evening with reserve-team managers Steven McCool and Andy Norman taking the reins for this Saturday’s local derby against Burton Park Wanderers at Occupation Road. A statement released by the club in midweek said: “It is with regret that we announce first-team manager Ian Benjamin has resigned from his role at S&L Football Club. “The committee would like to place on record their thanks to Ian for his efforts over the past two seasons, results on the pitch may have not been satisfactory but the effort and dedication from Ian can not be faulted. “We wish him well in his future endeavours. “Reserve team managers Steven McCool and Andy Norman will be taking the reigns for the home game against Burton Park Wanderers on Saturday, as the reserves are without a game. Anyone who would like to apply for the role should email chairman John Davies to foundrychairman@hotmail.co.uk. The final Division One action before Christmas gets under way with a big local derby at Chancery Lane tomorrow (Friday) night. Thrapston Town entertain Raunds Town, who will move back into second place if they avoid defeat. But the big game of the weekend is at Hayden Road on Saturday as fourth-placed Rushden & Higham United host Buckingham Town, who are currently two points above them after they moved into the second automatic promotion place last weekend. Irchester United will be looking to extend their unbeaten run to seven matches when they host Oakham United. Wellingborough Town ended a run of three defeats in a row in the Premier Division with a fine 2-2 draw with leaders Newport Pagnell Town at the Dog & Duck on Tuesday night. The stalemate came just three weeks after Stuart Goosey’s team had been thrashed 7-1 by the same opponents. Goals from Nat Ansu and Mark Pryor, from the penalty spot, sealed a point for the Doughboys are without a game on Saturday. Rothwell Corinthians will be hoping to be back in action this weekend as they make the a trip to Kirby Muxloe. 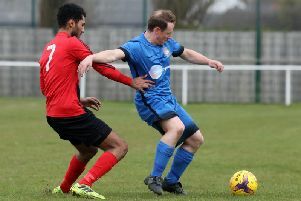 Desborough Town will be bidding to bounce back from a surprise 5-3 home loss to ON Chenecks last weekend when they head to Sileby Rangers on Saturday. Whitworth, meanwhile, face a tough test as they entertain fourth-placed Leicester Nirvana at London Road.